Silver trading yesterday was characterized by a degree of volatility ahead of the FED statement which, once released, saw the price of silver manage to hold onto its early gains as equity markets responded favourably and the US Dollar weakened. Overall silver trading prices ended the day 23 cents higher to close at $14.153 per ounce. Although the FED statement was more or less the same as that of July, only varying by a mere 10 words, markets seem as determined as ever to maintain their optimistic mood. From a technical perspective yesterday’s candle was good news for silver trading bulls as it ended the day positive from both a technical and sentiment standpoint. 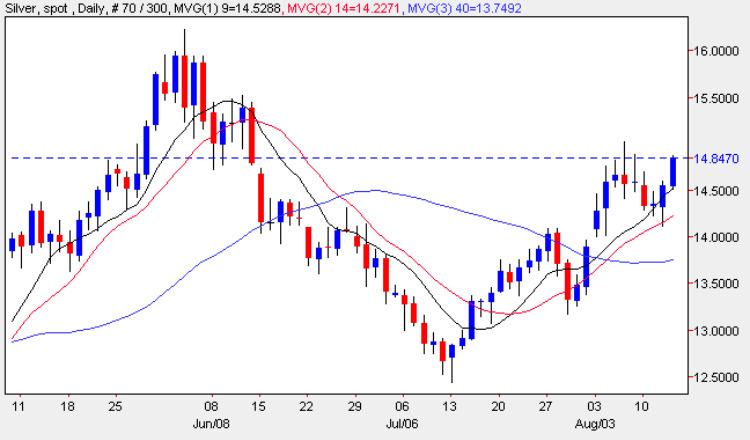 The deep lower wick found support from the 14 day moving average and the close of the day ended above the 9 day moving average suggesting that we should see silver prices rise today as we break back above the $14.70 resistance and move higher to re-test the next level in the $15 per ounce region. My silver trading suggestion is to look for small longs on an intra day basis but while keeping a close eye on the US Dollar for any signs of a change in investor sentiment.